My university worked to determine my student teaching placement as soon as possible. This allowed me to reach out and introduce myself before I showed up on the first day. Along with a brief introduction, it’s a great time to ask a few questions to help you prepare for student teaching. It also shows your cooperating teacher that you’re professional. So consider asking any of the following 15 student teaching questions. What are the requirements for lesson plans? Do you have a particular format that you would prefer for me to use? How often will we meet for planning? What are your goals for the semester, and how can I help you meet your goals? How do you group students in the classroom? Is there any methods that you use? What are your grading procedures? How do you track grades for your students? Do you have any ESL students or students with IEPs? Is it possible to see the IEP? What is your classroom discipline policy? What strategies do you use when one of your students misbehaves? Do you have any classroom bulletin boards or displays? Would you like me to change them while I’m student teaching? How do you communicate with parents? How often do you communicate with parents? What is your field trip policy? Will I be responsible for planning a field trip during my time as a student teacher? What are some of the specific challenges that you face in this grade or specific subject? What resources do you use in your classroom? Are there any websites, books, or other resources that I can peruse before starting my time as a student teacher? What are your expectations as far as my independent teaching time? How does your school or school district view standardized testing? What can I do to prepare the students for the exams? What is your contact information? What’s the best way to reach you outside of school hours? Think about the student teaching questions that are most important for you to know. By asking these questions, you can impress your cooperating teacher with your professionalism. 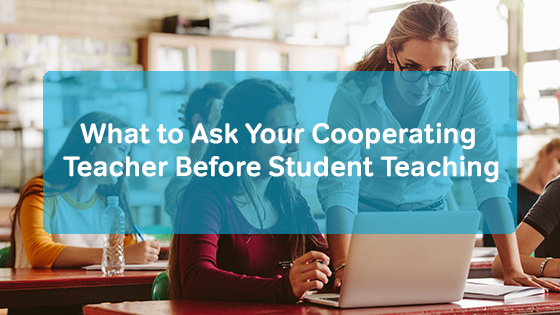 What other questions should you ask your cooperating teacher before student teaching starts? Add your ideas in the comments below.